The price of EOSUSD was in a bullish trend mode. This cryptocurrency price approached the recent highs of $2.82 levels but the price was retracting because of the resistance at the $2.8 price level. 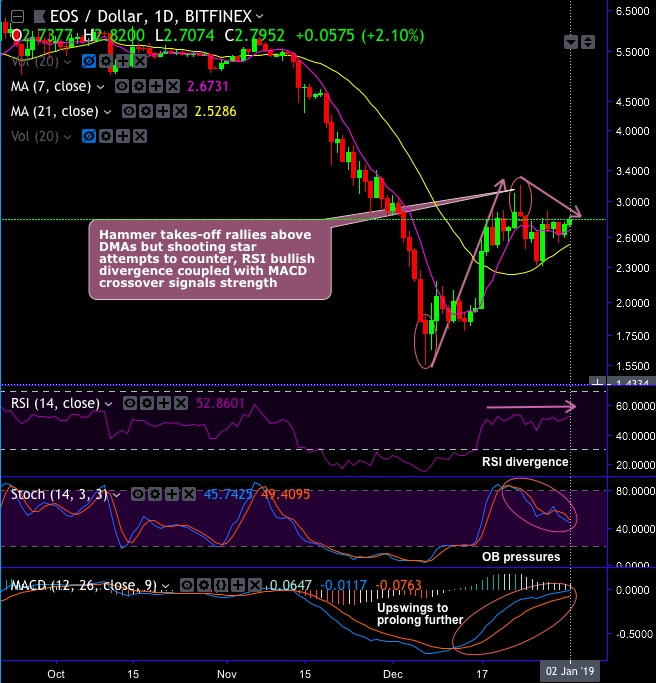 Technically, the pair has occurred at the hammer at 1.7589 levels that takes-off rallies above DMAs but shooting star attempts to counter, RSI bullish divergence coupled with MACD crossover signals strength. Since on December 28, the price of EOS was range bound between the levels of $2.6 and $2.8. On a broader perspective, the bears have managed to breach below double top neckline at 3.9687 level, the attempts of upswings are restrained below 7&9-EMAs. We could foresee mild upswings in the days to come, however, one should not be surprised if it continues the bearish streak. The buying sentiments are noticeable as the recent announcement from Huobi of its Derivative Market (Huobi DM) exchange. The announcement came in at the Crypto-frontiers conference in New York City. The latest one is that they have come up with the EOS contracts. One could expect dips upto 1.5483 levels if the above news fails to develop fundamental sentiment. Notably, the platform also purportedly provides tools for hedging and controlling risk and uncertainty. This would be available to its clients in selected countries, will provide a comprehensive suite of sophisticated digital asset trading services including cryptocurrency contract trading. Luring leverage offering: Huobi DM claim to offer 1X, 5X, 10X, and 20X leverage. Joshua Goodbody, General Counsel of Huobi’s Global Institutional team, had mentioned in the past that: More sophisticated investors and traders from more established financial markets looking to gain exposure, including institutional players are visible in swiftly maturing phase of cryptocurrency gamut. At the same time, we think many experienced, successful cryptocurrency traders are looking for a broader range of investment tools than has traditionally been available. Huobi DM is tailor-made to address these sorts of needs, Goodbody further appended. Currency Strength Index: FxWirePro's hourly BTC spot index has flashed at 142 (which is bullish), while hourly USD spot index has shown 37 (mildly bullish), while articulating at 11:33 GMT.